When we want to leave our mark on Mars today, we simply send over a few Rovers to roll around in its red soil. But 150 years ago, scientists had very different plans for contacting the planet, including one French inventor who wanted to use the refracted light of the sun to sear a welcoming message into the Martian desert. Charles Cros was a reputable inventor who developed several key advancements in color photography and an early version of a phonograph. And he was also convinced that spots of light seen on Mars (probably clouds) were giant Martian cities that we should try to talk to. In 1874 he started work on an ambitious proposal to build a giant mirror that would direct a ray of sunlight towards Mars. But that's not all: He wanted to use the rays to place a message on Mars, by burning large letters onto the Martian landscape. He spent years petitioning the French government to build this mirror until his death in 1888. After American astronomer Percival Lowell wrote that he thought he might have seen canals on Mars in his 1895 book and H.G. Wells published War of the Worlds in 1897, the obsession with communicating with Mars reached a global fever pitch. In 1919, Popular Science published a cover story devoted to several methods that might be used to send a message to the Red Planet, as chronicled by a 1920 short film by Max Fleischer called Hello Mars. These plans included installing millions of electric lights to create an massive "flash," or—the more affordable version—tying strips of black cloth to giant motors to create a lo-fi high-contrast signal. On the cover was this proposal: A huge cantilevered mirror that would reflect the sun's rays up to the Red Planet. However, cautioned the magazine, humans had to be patient. 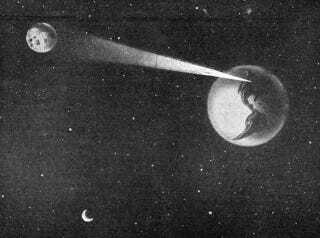 Due to the position of Mars in relationship to Earth, we wouldn't have a chance to try our big flash until 1924. When 1924 came around, coincidentally, several radio operators shut down their outgoing broadcasts that August, so they might "listen" to any messages Mars was trying to send to us. Although Cros's interplanetary magnifying glass seems implausible (and dangerous!) it was not as wacky as another thwarted plan to attract Martian attention: In 1819 Austrian astronomer Johann von Littrow suggested lighting huge fires in geometric shapes across the countryside that the Martians would surely recognize as a message for them. Building a mirror is one thing but burning down our own planet to get the attention of another, now that just makes us sound desperate and sad.